The Winchester, a typical London pub. Shaun (Simon Pegg), his girlfriend Liz (kate Ashfield), her two friends David (Dylan Moran) and Diane (Lucy David) are in the pub. Shaun’s best friend, the foul mouthed (and minded) overweight layabout, Ed (Nick Frost) plays the slot machines. Shaun is getting a hard time from this girlfriend; she wants to spend more time with him, be more exciting and do more than sit in The Winchester with Ed. She wants him “to live a little?. The next morning, Shaun wakes up and starts his day by playing video games with Ed, before he has to go to work. Shaun’s flat-mate, Pete, has a rant about Ed has outstaying his welcome as a guest by “five years?, not getting a job, not taking telephone messages, and wasting his days. Shaun defends Ed before he and Pete go to work. As Shaun leaves, Liz leaves a telephone message - to change their date by an hour - he doesn’t hear the message. Ed ignores Pete, plays video games and doesn’t tidy up. He also doesn’t take notice of Liz’s message either. 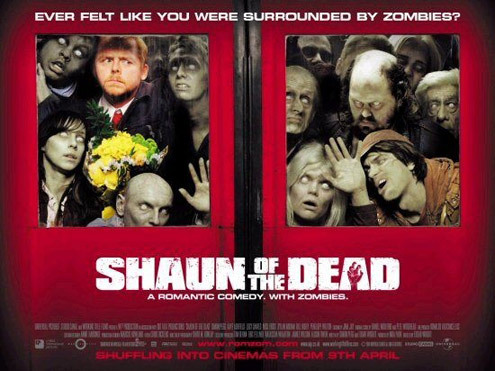 Shaun goes to work and notices strange front page headlines in the papers, people falling in the street, news reports of military involvement and attacks. He works in an electronic retail shop, as the manager, with bored / disrespectful teenage assistants. His step father, Philip (Bill Nighy) comes to asks him to bring his mum the flowers he should have brought over for Mother’s Day when he comes for the bi-monthly visit. Shaun clearly doesn’t like him. Philip notices that Shaun’s biro has leaked over his shirt and says, “You’ve got a bit of red on you? (which is repeated through the film). He starts to discipline a member of his staff for using a mobile, when Liz rings to check he has booked a table for their date. He pretends it is a work call and ignores what Liz is saying (she is reminding him about the table that evening).